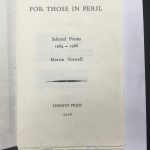 This entry was posted in Collection News and tagged Libanus Press, Michael Mitchell, printing, Printing Collection, Private Press. Bookmark the permalink. Posted on behalf of David Knott, former Rare Books Librarian at Reading University Library. Sad news indeed. Michael Mitchell was a good friend of Reading. I first met him in, I think, 1977 when he was still working down the gob mine – to use his own colourful description of dentistry. (Nonetheless he once said he found working with type rather coarse compared with dental work.) At that time I was trying to keep tabs on the activities of local private presses – another was the Rocket Press. Michael’s press was in the garage of his house in Hermitage but he had as yet to produce anything more substantial than the odd, albeit tempting, piece of ephemera. He must have wondered what I was up to and what was in it for him. Nonetheless he was welcoming, friendly and forthcoming. 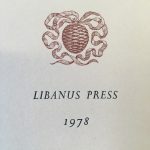 As Libanus started to become more productive I acquired its publications for the University Library. Perhaps this support, in a small way, helped the Press make its way in these early days. 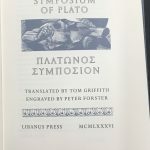 In 1988 Michael gave a talk to the Imprint Society of Reading entitled ”From platen to packaging: the first ten years of the Libanus Press”, describing how the most successful of the fine books could be adapted for more commercial and widely-available editions. 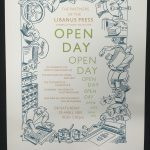 Computerized production and design methods in due course took over for book work but Michael retained the traditional letterpress for jobbing work, ultimately under the expert and experienced hand and eye of Brian Bailey. 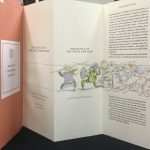 In 1994 and again in 2004 it was my pleasure to commission the letterpress workshop, which produced a delightful and distinguished suite of stationery for the wedding of each of my two daughters.